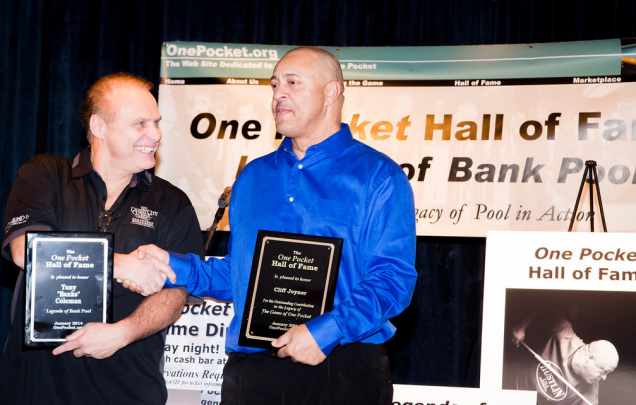 The 10th annual One Pocket HOF dinner featured the induction of Cliff Joyner for One Pocket, and Tony Coleman for Bank Pool. In addition, the late Hubert ‘Daddy Warbucks’ Cokes was inducted posthumously. Cliff is recognized as one of the top players of his generation, with many One Pocket tournament victories from coast to coast. Of course, Cliff is known to get into plenty of action too. For Coleman, action was the name of the game. In fact, both Cliff Joyner and Tony Coleman are prior winners of Derby City’s “Louie Roberts Award for Action/Entertainment”. Hubert Cokes was represented by fellow HOF’er Nick Varner, who was mentored by Cokes as a young man.